Skidmore is a private liberal arts college with a core belief that “creative thought matters.” A small school with an enrollment of approximately 2,500 students, the suburban campus is spread across 890-acres. Skidmore is located in Saratoga Springs, NY, a charming, historic town with a main street filled with shops, restaurants, galleries and parks. Transportation: The closest airport is the Albany International Airport, about 30 miles south of the Skidmore campus. You can also take Amtrak which stops at Saratoga Springs Amtrak station about 2.5 miles from campus, or Rensselaer (Albany) Amtrak station the Rensselaer Amtrak station which is 36.5 miles south of the Skidmore campus. Alternatively, Greyhound offers daily service to Saratoga Springs. Coffee: Everyone gathers at eclectic Uncommon Grounds, a long time student and neighborhood favorite serving the best coffee and bagels in town. This is a dream of a coffee house also good for a quick lunch with signature bagel sandwiches and daily soups. Breakfast: Tiny Country Corner Cafe is popular for a cozy, quaint breakfast where the fried oatmeal is a must order! Other student favorites include Spot Coffee and Mrs. London’s Boutique Bakery. Lunch: Scallions is a lively lunchtime spot known for their creative menu of salads and soups and a dedicated selection of vegan choices. Esperanto offers a plethora of options from pizza to quesadillas to their infamous creation—the Dough Boy - a blend of chicken and cheese wrapped in pizza dough. You’ll see many Skidmore students eating lunch (and breakfast) at the Triangle Diner. Don’t have much time? Grab a soup or sandwich at Putnam Market, a gourmet market right on Broadway. Casual: For Spanish fare and tapas head to Boca Bistro. Forno Toscano Bistro showcases authentic Italian cuisine and excellent wood-fired pizzas. Hattie’s menu is influenced by traditional southern specialties and is also a good spot for brunch. A Step Up: California style Max London’s is everyone’s first choice when his or her parents come to visit. They don’t take reservations but as one student states: “you’ll know why everyone waits after your first bite of their homemade bread.” (Max London’s is also extremely popular for brunch for their breakfast pizzas, challah french toast, and chicken hash.) New to the Saratoga dining scene and garnering early praise is Taverna Novo showcasing wood-fired pizza, risottos, and pasta, plus more substantial entrees such as a wood-roasted porchetta. For upscale Italian cuisine book a table at Chianti Il Ristorante. Located in a beautiful, restored historic building dine at 15 Church. Sweets: Indulge in frozen yogurt or sorbets at Plum Dandy Frozen Yogurt. Satisfy your sweet tooth with chocolates, caramels and ice cream at Kilwins open till 10 during the week and 11 on the weekends. With 18 flavors of homemade fudge and an array of old-fashioned ‘penny candy ‘its no wonder Saratoga Candy Co. has been a town favorite for 20 years. Local Attractions: Saratoga comes alive in the summer with world-class performances at the Saratoga Performing Arts Center, commonly known as SPAC, and horseracing at the Saratoga Racetrack, the oldest thoroughbred racetrack in America. Off-season you can still explore the history of racing at the National Museum of Racing. As Saratoga is the summer home of the NYC ballet it’s not a surprise it’s home to the National Museum of Dance, the only museum in the states devoted to the history of dance. On a nice day, have a picnic in scenic Congress Park with duck ponds, mineral pools, and a wooden carousel. The park is home to the Saratoga Springs History Museum. Just toured the Skidmore College Campus? Are you a Skidmore student, parent or Alumni? 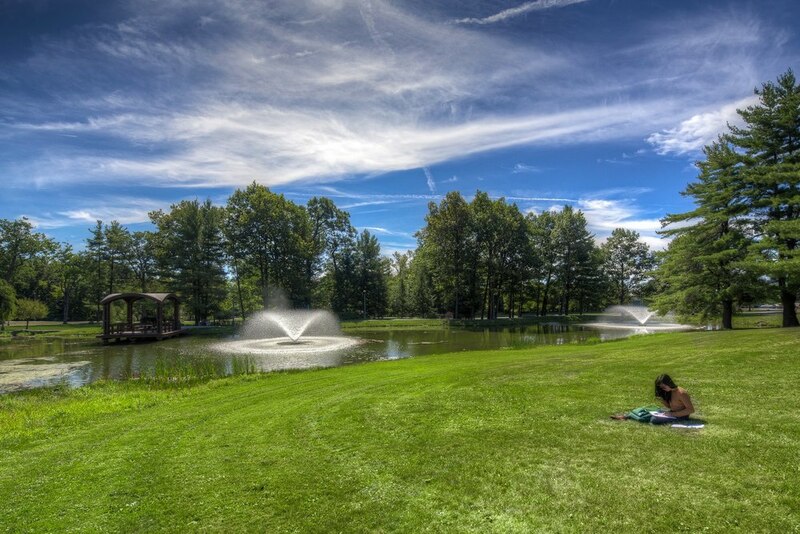 Fill out this 2 minute survey to supplement our Daytripper University Guide for Skidmore College!